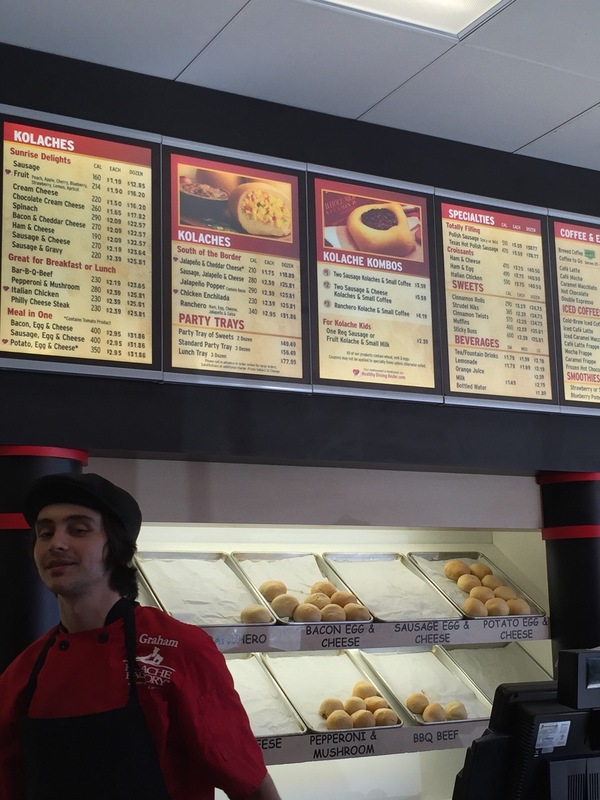 What is a Kolache? A Kolache (pronounced Ko-lack-key) is Czech or Slovak pastry that holds a dollop of fruit, rimmed by a puffy pillow of supple dough​. 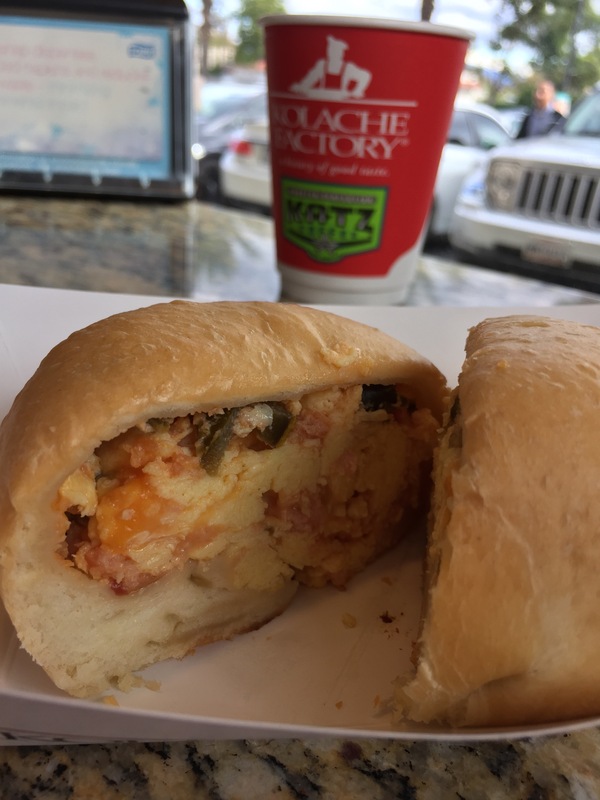 Czech settlers created klobasniky after they immigrated to Texas, and also refer to it as kolache, which is popular in central and southeast Texas. It often uses similar bread, but is filled with a link of sausage or ground sausage. They may also contain ham, cheese, jalapeño, eggs and bacon/sausage, potato, etc., and they resemble a “pig in a blanket”. 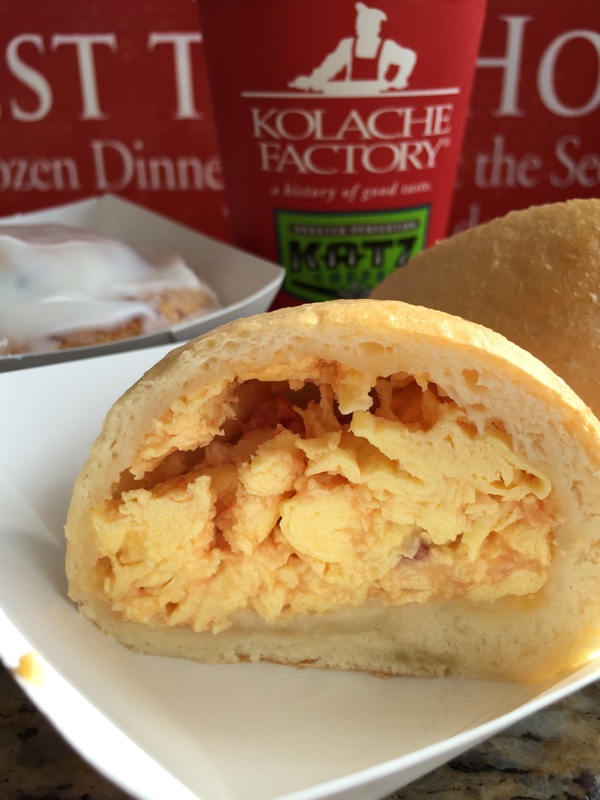 Kolache Factory was founded in 1982 in Houston, Texas by co-founders John and Jerri Banks, who identified a need for a fresh, high quality breakfast that could be eaten “on the run.” They have 38 locations in the United States, but only 1 in California. I wanted to bring some goodies to a meeting, so I stopped by the Tustin location. 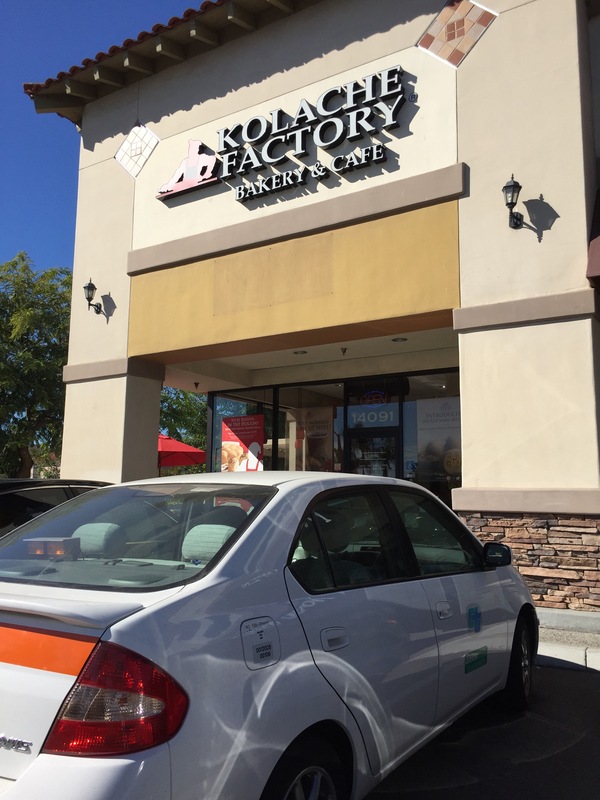 The store is located at 14091 Newport Avenue, just south of the 5 freeway, in a busy strip mall clustered nearby fast food places like Carl’s Jr, Little Caesars, and the popular Tan Hoang Huong (THH) sandwich shop. 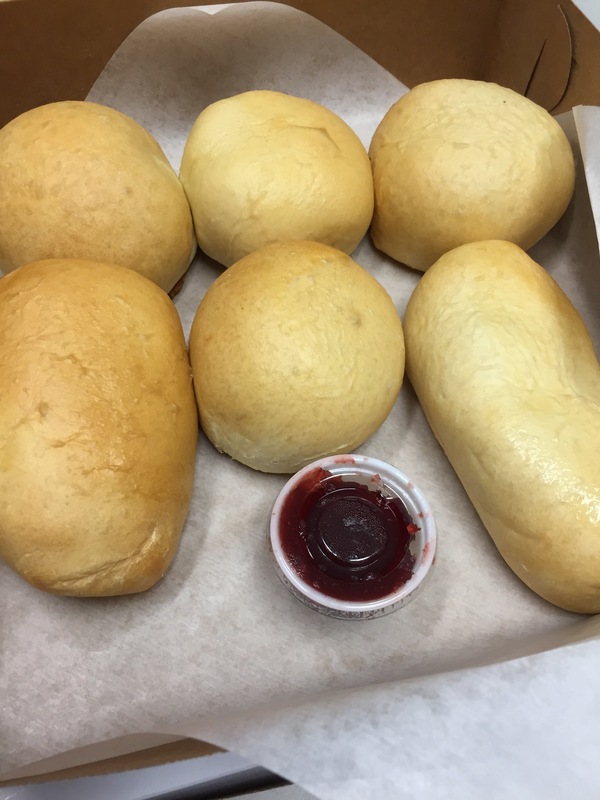 Prices for these ball of dough starts at $1.19 for a sausage kolach to $3.75 for a specialty egg filled croissant. On their website, I signed up for their email and received a “buy 3- get 3 free” coupon, and used it to buy 6 savory kolache, as they were more expensive than the sweet ones. It took me a while to pick 6, but I finally decided on: BBQ beef, pepperoni, sausage and cheese, Italian chicken, turkey and dressing (their seasonal kolach of the month), and the chicken enchilada. 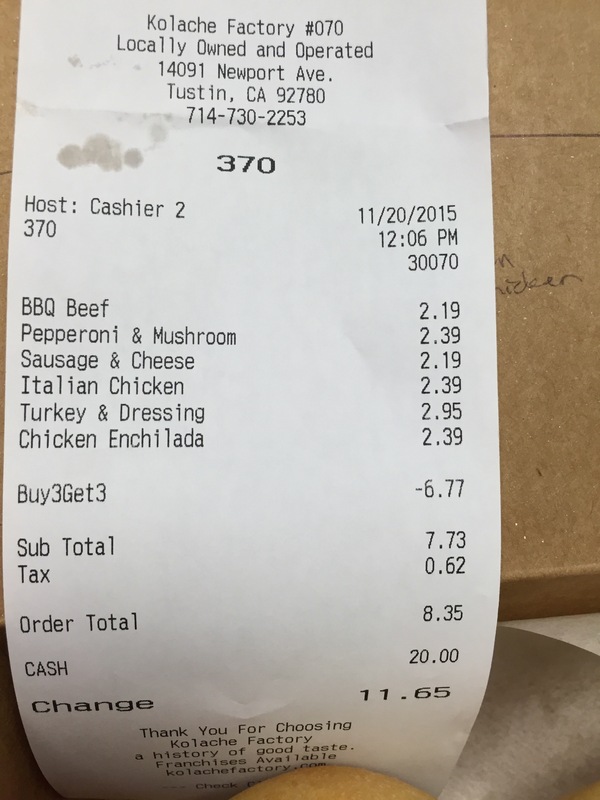 With the Buy3, Get 3 discount, my total came to $8.35, saving me $6.77. For the sweet or non meat kolache, I decided to make it an even dozen and got 6 more: a chocolate cheese, 3 fruits: blueberry, cherry and apple, and 2 of the flavor of the month: pumpkin pie. 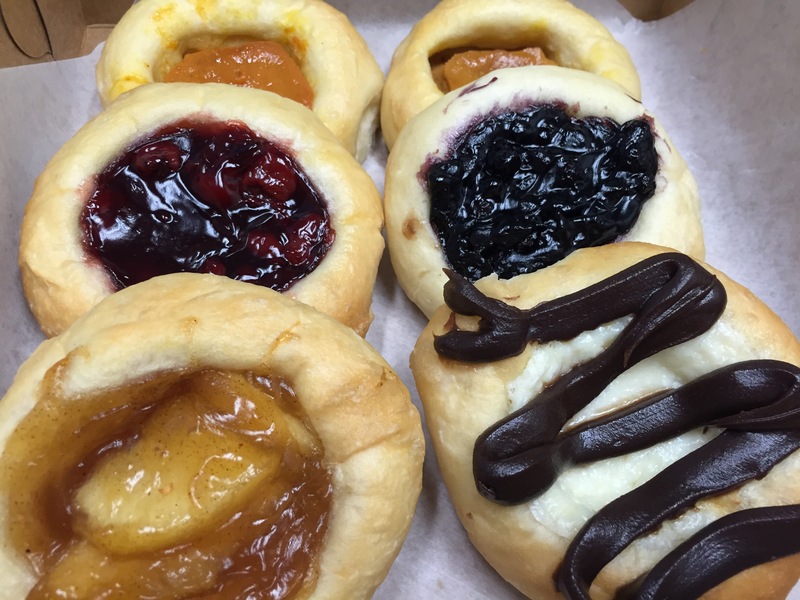 Prices for the sweeter kolache were cheaper, ranging from $1.50 for the fruit to $2.19 for the seasonal pumpkin pie. My total for those 6 came to $10.53, bringing the grand total for the dozen to about $20 (including the B3G3 discount). While not terribly expensive for a dozen treats, it wasn’t the cheapest either. I was told to refrigerate the items, and for the sweet kolache, serve at room temperature. For the savory, I can microwave one at 20 seconds or the entire box for 1 minute. Unlike the sweet kolache, where you can see the fruit on the top, its a mystery on how the inside of a savory one looks like without cutting one open. I’m sure it looks like a hot pocket or empanada. Yelp reviews were positive, so I am sure that it is tasty, and that this was a good pot luck contribution. 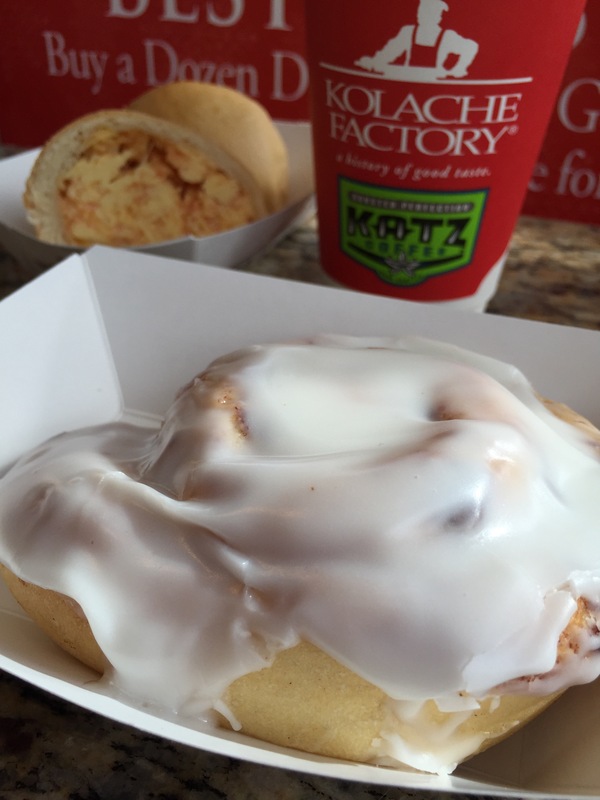 Kolache Factory is open from 6:00 am to 2:00 pm, and their web site is www.kolachefactory.com. Went for breakfast and picked up the Ranchero, Sunshine, and cinnamon roll. This time we cut it open.